Here is a bear who has nowhere to go, so he's plodding along through the cold winter snow. 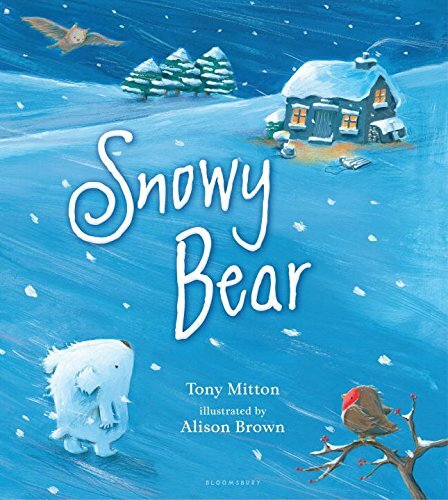 In the icy-cold heart of winter, a little snowy bear wanders through the snow and searches for a home. But where can he go? Each warm place has been claimed, and there is no room for a bear, no matter how little. Suddenly he sees a flickering of light, orange and bright against the snowy ground. It's a house! As Snowy Bear pushes open the creaking door, he feels warmth spread over him. There's a girl by the window, who's also looking for a friend, and, somehow, deep down, Snowy Bear knows that he is home.